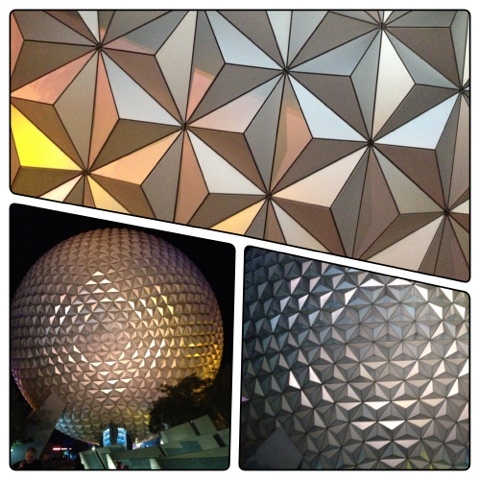 Plus the Magic: Wordless Wednesday: Disney "Weenies"
This image, this icon, this structure, this attraction- Spaceship Earth IS WDW for me. We love the Big Ball as my darling princess started calling that at age 3. Its fun to look at and ride! Today I was at school library, saw a book "How The Printing Press was Made"....and I thought of Dame Judi! Spaceship Earth is like the most relaxing ride ever!! Especially when you go backwards. I love it. When I was little I was convinced it was a giant golfball. Even funnier, when word got out that Disney purchased Lucas Films, my husband exclaimed "Now they can finally turn Spaceship Earth into a Death Star!!!" Wrong park, sweetheart. Wrong park. Very nice! I love Spaceship Earth too! Love the close up of one of our favorite Weenies. Love the color changing at night. Thanks for sharing! The 'ball' as my son calls it is down for refurb right now. So it is just fun to look at this trip. That topmost image is spectacular!! What a great choice of a Disney Weenie! It just draws me in everytime!! Beautiful shots! What a great collage and it really does highlight the "Big Ball" (my kids used to call it that too :) Love that close-up shot you got. It's definitely one of the first weenies I can remember. I have to agree that SE is the weenie that best represents WDW. It is unique to WDW and also symbolizes the park that was inspired by Walt's vision of the future. I like the collage!